Question 1: Do you still believe that Hoya densifolia is a synonym for Hoya cumingiana? -- Sent by several readers of PS-The Hoyan. Reply: I concede that it is not BUT I still am of the opinion that the hoya being circulated in US commerce as Hoya densifolia IS Hoya cumingiana. I have several reasons for this determination. 1). Native habitat. Hoya cumingiana is from the Philippines, as is the hoya circulating under the misnomer of Hoya densifolia. 2). Hoya densifolia is a native of Indonesia (the island of Java). It is true that it could exist in a lot of different locations, I don’t believe that is the case here. Recently, I was given a hoya matching its description. 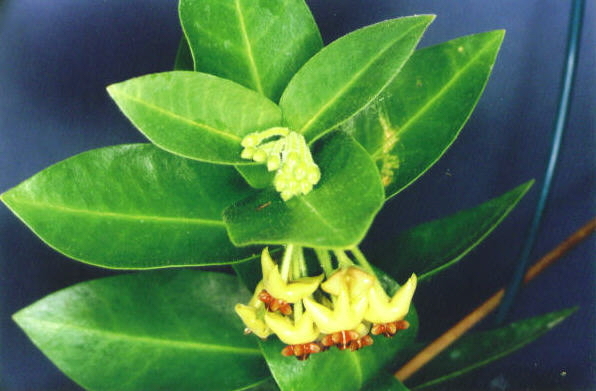 Although it is not from the exact location where Hoya densifolia was first discovered, it is said to have come from an area where many Javan species are also found. It is not the same species as the Philippine species. I haven’t seen flowers yet but I have seen a picture of a blooming plant. What I see in that picture convinces me that it is Hoya densifolia, but I’m going to have to wait for actual flowers to know for sure. 3). 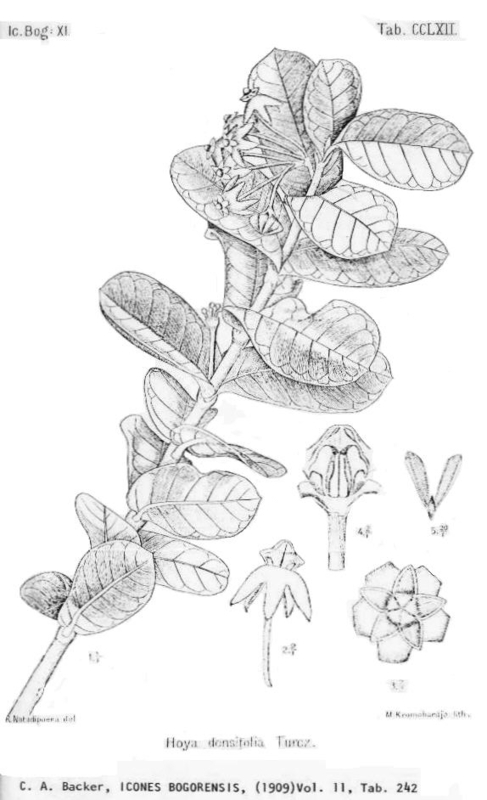 A careful examination of the Philippine material and publications illustrating Hoya cumingiana and comparing them with C. A. Backer’s very detailed illustration of Hoya densifolia have convinced me that all previous lumpers (including me) may have been too hasty in lumping the two together. The above picture is from Flore des Serres, Tome 23, page 120 (1880). A mirror image of the same picture can be seen in Curtis’ Botanical Magazine tab. 5148 (1859). The original watercolor is said to be in the New York Botanical Garden Library. I didn’t see it when I was there but, to tell the truth, I didn’t think to look for it. Above: Hoya cumingiana herbarium material from the Philippines. This picture was reduced in size to fit on the screen. Leaves measure About 7 cm. long by 3.5 to 4 cm. wide. Note the acute leaf tips. Above: Hoya densifolia herbarium material from Java. Picture was reduced to fit the screen. Leaves measure about 5 to 6 cm. long by about 3.5 cm. wide. Note the obtuse leaf tips. 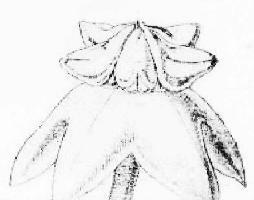 Above: Enlarged flower from Backer’s Hoya densifolia illustration. Look closely at the corona. There you’ll see corona lobes that are “scooped out beneath, very much like the corona undersides of Eriostemma section hoyas (but this is not an Eriostemma). 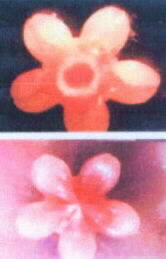 Also the corona shape differs from that of Hoya cumingiana. 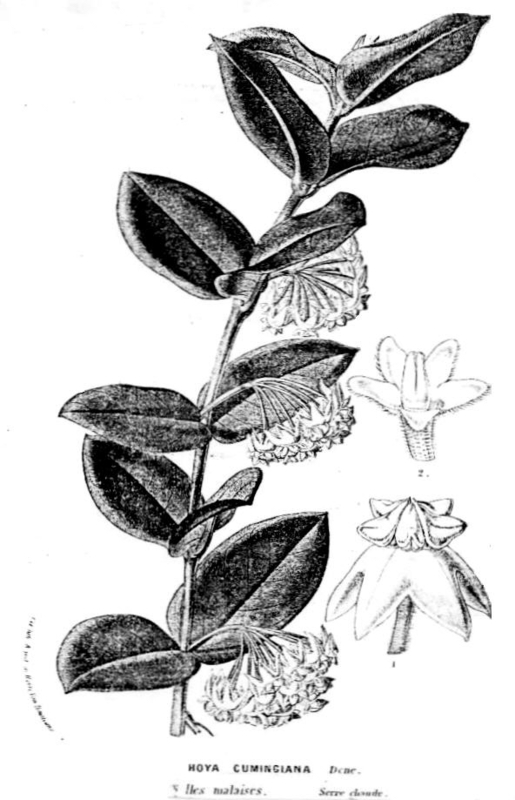 Above: Enlarged picture of the Hoya cumingiana flower from the Flore des Serres illustration. Compare it with the picture of the Hoya densifolia flower. Note that the lower surface of Hoya cumingiana, part of which shows at the outer end of the corona lobes facing to the front, is a narrow channel where the two margins meet, just as in hoyas of most other sections. At this time, Hoya densifolia is not in circulation. I predict that it won’t be long before it is. Please don’t ask me who has it and where it can be purchased. You can count on the person who has it (if this person really does) will waste no time in advertising it as soon as enough stock is available. 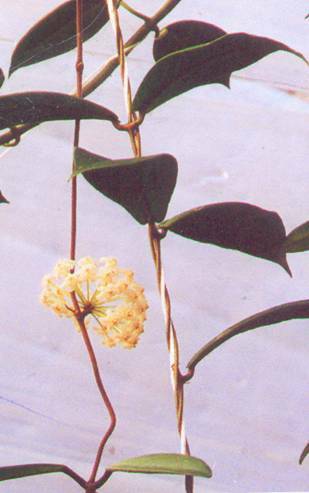 An interesting bit of trivia, concerning Hoya densifolia: Its original publication is the only original hoya publication that I do not have a copy of --- I’ve searched for it for 30 years but no source I’ve asked has a copy. The interesting thing is that C. A. Backer wrote in his Icones Bogorensis vol. 11 (1909) that he had not been able to procure a copy of the original description. Left in each illustrations above: Hoya cumingiana. Right in each illustration above: Hoya densifolia. Statement 2: Ha, Ha, I know something you don’t know --- the hoya you call sp. from Kumning Kina is actually Hoya revolubilis. ----- Sent by a member of the HoyasRUs Forum. My reply: NO WAY, JOSE! Not if the flowers that growers of the Kumning Kina species have furnished me are truly from that species. While the foliage is very similar in size and shape, the flowers of these two species are entirely different. I have not bloomed this species so I do not know with 100% certainty that the flowers furnished to me by two other people are truly Hoya sp. from Kunming, Kina flowers, or not. I have no reason to believe that they aren’t because these hoya growers have always sent correctly labeled material to me in the past. 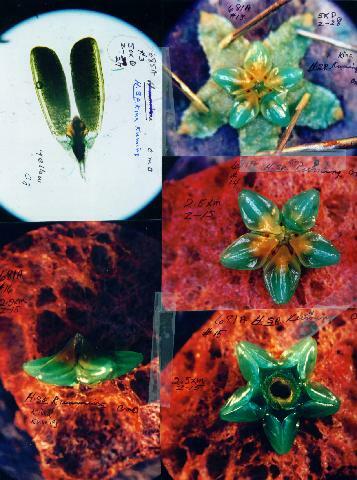 The flower parts, above, are of the species from Kunming, Kina – unless two sources were sold the wrong plant so labeled. Note the obtuse tips of the corona lobes. The green colour comes from a dye which was added to make the various flower parts show up when photographed. The flowers had been sent to me in alcohol, which bleached the natural colour out of them. Compare these flower parts with those in the pictures below. 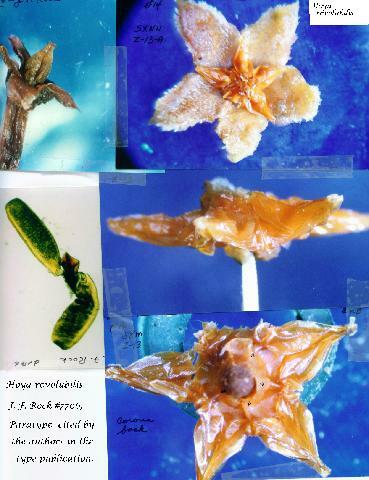 The flower parts in the picture immediately above are from an 86 year old, dried specimen. It is J. F. Rock #7706. which Tsiang & P. T. Li cited (in the original publication of the name Hoya revolubilis) as being the same species. It is either a paratype or a syntype (I find it difficult to understand the difference between these two ranks of types). Flowers for photographing were donated to me by US National Herbarium.. Supporting the differences shown here is the Tsiang & P. T. Li description, which says that the leaves of Hoya revolubilis have very obtuse apexes (“apice obtusissimis” is the way they put it). While the leaves of the Kunming, Kina species are not ‘very acute,” but not “very obtuse” either. 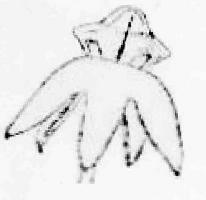 Above (on page 7) a typical leaf from a living Kunming, Kina plant. 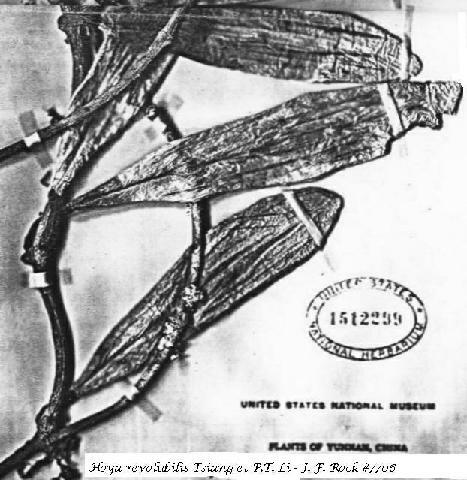 Compare this with the leaves on the specimen sheet pictured below. Note that I reduced this leaf in size to make it fit the screen. 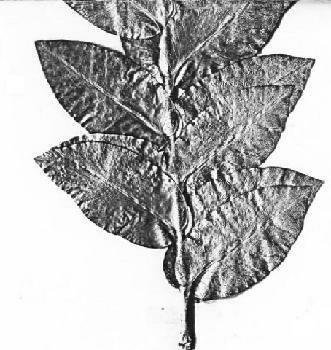 Leaves on this species measure from 15 to over 20 cm. long by from 3 to 5 cm. wide. The above is a portion of the J. F. Rock specimen #7706 (Paratype of species). Note that the lines you see in the scan that look like parallel veins are not veins at all. They are slits that were cut into the leaves that helped make them lie flat so that they could be taped unto the paper. Note, also, that I reduced the size here to make this portion fit on my screen. 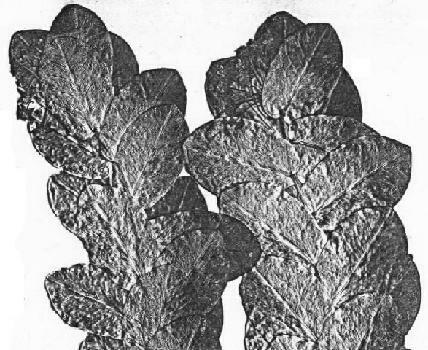 The leaves shown here are 12 to 14 cm. long by 2.5 to 3 cm. wide. Tsiang compared Hoya revolubilis with Hoya liangii Tsiang but added that it differed in Hoya liangii having corona lobes that are “rounded at their outer angles” (“angulo exteriore coronae rotundato”). They described the Hoya revolubilis corona lobes as, “outer angle acute” (“angulo posteriore acuto”). Now, would someone tell me, What’s this? This picture was cut from a larger picture, which was sent to me along with a generous cutting of the Kunming Kina species. I’m inclined to think that the stem that holds the flower umbel is not the same species as the vine on the right, however, my source assured me they are the same. 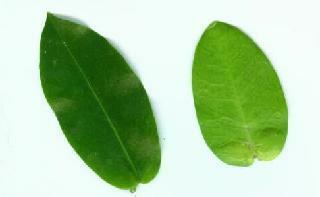 The vine on the left shows only one complete leaf. That leaf can’t possibly belong to the same species as the leaves on the vine to the right. It is my opinion that neither is Hoya volubilis Tsiang et P. T. Li. NOTE: All the colour photographs in this issue were taken by George Slusser, except those that follow. is a corona from the flowers shown below?????????? Her picture is rather fuzzy but it’s clear enough that you can see that the corona lobes on those flowers are decidedly acute at their outer ends, while those in the close up are extremely obtuse (rounded). Is she nuts or are we hallucinating? This sort of thing is typical of Fraterna! And it gets worse with each issue!!!!!! !